Univision’s Jorge Ramos went toe-to-toe over immigration with Fox News host Sean Hannity. 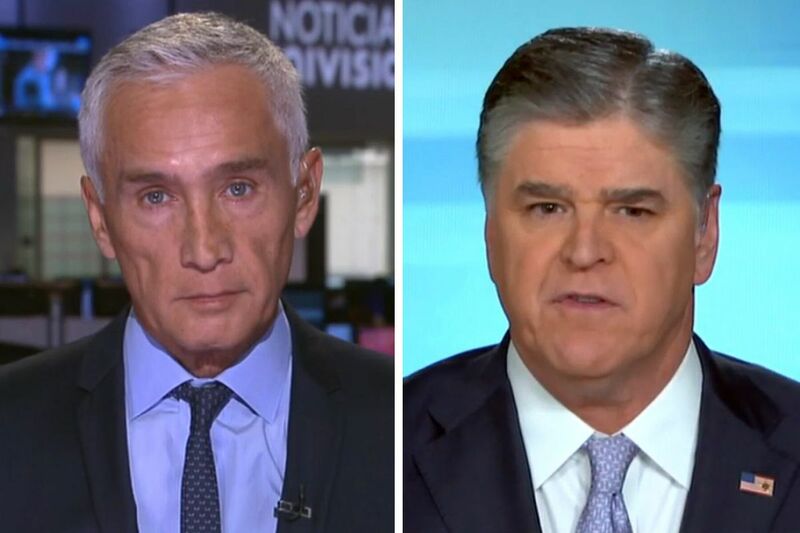 Jorge Ramos, the well-known anchor of Univision's Noticiero Univision, didn't hold back in a combative interview about immigration on Fox News Wednesday night, accusing host Sean Hannity of broadly painting immigrants who have entered the country illegally as violent criminals. "I'm not here to defend real criminals," Ramos said. "But you don't tell your audience the truth, the facts, that immigrants are less likely to be criminals than those born in the United States." "That's not factually accurate," Hannity shot back, citing statistics from the U.S. Sentencing Commission that, in 2016, 13 percent of all federal sentences were given to illegal immigrants. The overwhelming majority of federal sentences given to those in the country illegally are for crimes related to their immigration status. In terms of violent crime, just 15 unauthorized immigrants were primarily convicted of murder, 51 of assault and 13 of sexual abuse in 2016, according to data from the commission. Ramos countered by pointing to a different set of statistics from the Migration Policy Institute, a nonpartisan think tank, that show 7 percent of undocumented immigrants have been convicted of a crime but less than 3 percent involved felonies, which can include both violent and non-violent offenses. Hannity conceded Ramos' point that most undocumented immigrants in the United States aren't criminals, but defended President Trump against Ramos' accusation that Trump is "the most anti-immigrant president since the 1950s." "President Trump, who supported DACA…" Hannity said before being cut off by Ramos. "Let's not forget that the president who killed DACA is called Donald Trump, not Barack Obama," Ramos interjected, pointing to Trump decision to rescind Obama's executive order protecting "dreamers," undocumented immigrants who entered the country as children, from being deported. The heated discussion took place hours after Attorney General Jeff Sessions announced a lawsuit over California's "sanctuary" laws protecting undocumented immigrants from deportation. "California absolutely, it appears to me, is using every power it has — powers it doesn't have — to frustrate federal law enforcement," Sessions said at a news conference in Sacramento. "So you can be sure I'm going to use every power I have to stop them." That earned a strong rebuke hours later from California Gov. Jerry Brown, who argued the state's "sanctuary" laws were created with input from local law enforcement. Brown accused the embattled attorney general of lying to appease Trump. "Like so many in the Trump administration, this attorney general has no regard for the truth," Brown told reporters. "This is basically going to war against the state of California." The lawsuit could have ramifications for Philadelphia, which itself is a so-called "sanctuary city." The Justice Department argues that California is violating the Constitution's supremacy clause, which states that federal laws are the supreme law of the land. Officials in California argue that states have the constitutional right to govern themselves. "There is real uncertainty about who will win it," Ilya Somin, a law professor at George Mason University, told the Washington Post. In November 2017, a federal judge blocked Sessions' attempt to withhold federal law-enforcement money from Philadelphia over its "sanctuary city" status. "I'm very grateful to the court, but I'm angry we have to fight our own federal government when we have problems we could be addressing together that [the Trump administration] refuses to address because it doesn't play to their base," Mayor Kenney said following the ruling.